In this video from Tuesday 13 December 2016, Philippine President Rodrigo Duterte told an audience in Manila, (beginning at 0:28), "But in Davao I used to - do it personally - just to show to the - guys that - 'If I can do it, why can't you?' "
Duterte then added (in Tagalog), "I was really looking for an encounter, so that I could kill." 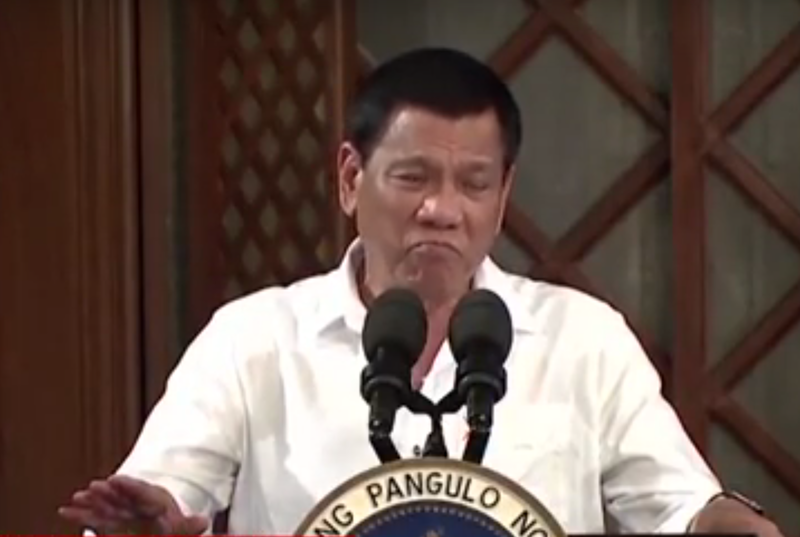 Note that during 0:29 - 0:30, President Duterte displays what is termed an "Exaggerated Pout". The exaggerated pout signals that rationalization and justification are transpiring - and those who make this expression are looking for others to co-rationalize and justify their decision/actions along with them. It's also a signal that at least at a deeper level, they were in conflict - and/or they know their actions/decisions will be harshly judged by some - however they've pushed past their psychological barriers and are now looking for others to jump on board. It's helpful to think of the exaggerated pout as saying, "Isn't it obvious?" or "This is clear to everyone, right?" - or in this example more specifically, "Anyone can see these people needed to be killed - we don't need no stinking trials or judges, right?" Summary: The Exaggerated Pout indicates active attempts at rationalizing and justifying - and those making this expression want others to agree with them.